The late afternoon sunlight in Sonoma County casts a golden glow over everything it touches. As we drive over the crest of a hill through Cabernet Sauvignon, Zinfandel and Chardonnay vines, SingleThread Farm appears beneath us in all its glory. The Russian River runs through the property, a winding oasis of dark green in the dusty late-summer landscape that sits just 70 miles north of San Francisco. The farm includes a greenhouse with more than 30 varietals of tomatoes, while a mind-blowing bounty of other vegetables, herbs and flowers abound in the neatly-manicured rows. There are eggplant and broccoli, summer squash, melons and turnips, kale and garlic, Jerusalem artichokes and vast bushes of herbs, while less immediately familiar are delicate long Japanese spring onions called negi and mustard greens called mizuna. Chicken coops, an heirloom fruit orchard, olive trees, beehives and a cattle paddock add to the supply of world-class seasonal organic produce that heads to the kitchens of SingleThread Inn and Restaurant, just seven miles away over the hill in the quaint town of Healdsburg. Both breath-taking properties are the creation of a hugely-talented husband and wife team, chef Kyle and head farmer Katina Connaughton. Together they have crafted one of the most critically-acclaimed and talked-about restaurants in America. As if three Michelin stars was not praise enough, they were also named as the Miele ‘One to Watch’ at the 2018 edition of World’s 50 Best Restaurants, a sure-fire sign that they will imminently break into the hallowed list. Spending time with them, however, one gets the distinct impression that awards and critical praise are the last thing they care about, primarily because professionally, they have nothing to prove. The high school sweethearts have spent more than two decades at the pinnacle of their respective professions. Clues come in the breakfasts served in the five supremely elegant rooms above the restaurant. From the English breakfast, ‘Mad Hatter’s Toad in the Hole’ and ‘Drink Me’ are two clear signs to global gourmands that The Fat Duck, Heston Blumenthal’s still-legendary Bray restaurant, played a very substantial part in their lives. That’s because in 2006 Kyle opened and spent five years at The Fat Duck Experimental Kitchen as head chef of research and development, while Katina worked as a gardener and chef at a private Victorian estate. Another breakfast option is the Japanese menu featuring dishes including misozuke king salmon, dashimaki tamago, fresh yuba with barrel-aged ponzu and house-made tsukemono. This impeccable execution, served kaiseki-style, comes thanks in part to the three years they spent from 2003 in Hokkaido, Kyle at no less an institution than Michel Bras’ Toya Japan, while Katina held a three-year residence at the Hokkaido agricultural centre where she immersed herself in Japan’s legendary farming and gardening prowess. It’s safe to say then that neither the SingleThread farm nor restaurant are lacking in experience, vision or attention to detail. An unmistakeably Japanese ethos pervades everything they do, rooted in the concept of 'omotenashi' that delivers a heightened sense of hospitality while anticipating a guest’s every need. It makes for a beguiling combination in the beautiful 52-seat dining room, one of the most striking, calming and beautiful that I can ever recall visiting. Kyle and Katina worked with designers AvroKo on the space, which won best restaurant design at the James Beard awards in 2017. There are linen lanterns, dark wooden panels and exquisite woven screens where delicate patterns reference the DNA sequencing of herbs. Seriously. Lighting and music are brilliantly orchestrated for each table, there’s a completely open kitchen which features rows of donabe earthenware pots and tableware, but most of all it’s the floral arrangements which truly take the breath away, a testament to Katina’s remarkable talent for an aesthetic which perfectly matches the food. She also takes care of the world-class produce back on the farm, allowing SingleThread’s restaurant menu to evolve every five days, dictated by 72 ‘micro-seasons’ which means produce is only served at its optimum ripeness. It’s that hyper-relaxed relationship and innate understanding which underpins SingleThread and makes it, well, singular. This translates into an exceptional eleven-course tasting menu at US$275 for lunch or dinner, customized to guests' dietary preferences and restrictions. That doesn’t include drinks, so realistically one is looking at upwards of US$400 per person– but it’s worth every last cent. 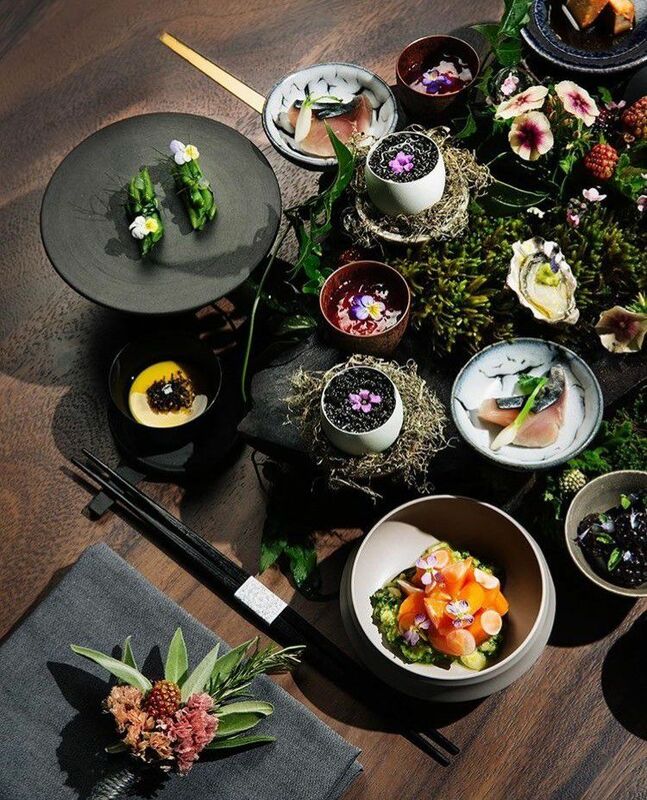 Lunch kicks off with an absolute showstopper as each dining table is adorned with a huge black wooden centrepiece covered in flowers, plants and delicate tableware containing your multiple amuses-bouches. The sublime selection includes plump Shigoku oysters from Washington state with freshly-grated wasabi, a turnip panna cotta with almond pesto and white truffle, a stunning sablé biscuit of cured foie gras, or Spanish mackerel with a brown butter purée and a marigold citrus gel. There are of course other highlights and crescendos, including an unbelievably good smoked Fingerling potato foam over kampachi, or ‘night and day tomatoes’, the sweetest and freshest tomatoes you’ll ever eat served two ways. Fittingly, lunch finishes with petits fours which includes three raspberries from their farm, served completely untouched, exactly as they were picked that same morning. For this diner they represented a true Proustian moment, a reminder of childhood and tastes past—a single thread linking back to simpler days.